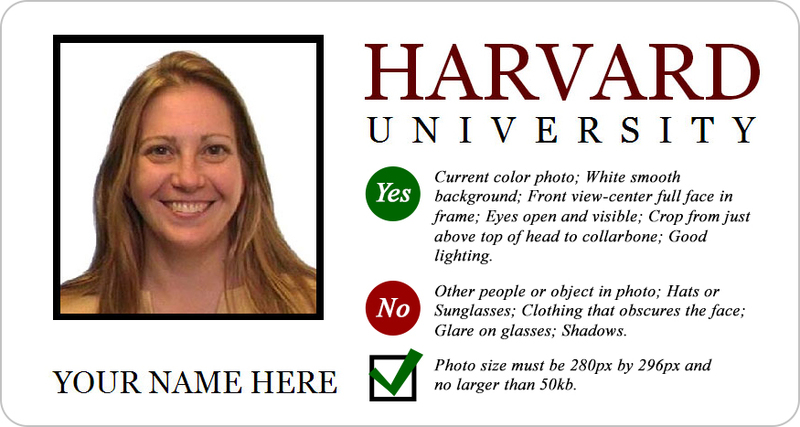 If you are a new incoming Harvard University student, please use this application to submit your photo for your official student ID card. If a suitable photo is successfully submitted in a timely manner, your ID card will be printed and waiting for you when you arrive on campus. The Harvard University ID card provides access to housing, dining halls, libraries, Crimson Cash, and more. Please be aware that your submitted photo must be no larger than 50k cropped to 280px x 296px and will also be utilized in such places as on-line directories, school facebooks, and class seating charts.